This is the FIRST issue of Yarn magazine! Published December 2005, this wonderful magazine is now published each March, June, September and December. The best way to find new knitting friends? Teach people to knit – and why not start with your kids? 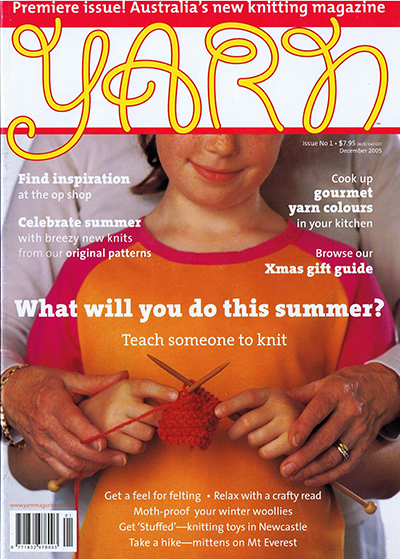 Issue 1 features ways to get little ones into yarncraft, from how to use food colouring and jelly crystals to make handpainted yarns to some simple ideas for projects (some of which don’t even require tools. The premiere issue of Yarn also features a knitter’s gift guide, op-shop inspirations, how to felt (and what to make when you do). There are also myth-busting tips from a museum conservator on safely storing your winter woollies, and profiles on toy knitters in Newcastle and a North American knitter who knitted some biographical mittens for a mountain climber. Of course we’ve also got sweet summer knitting, news and reviews that tell it like it is.